I carry the watermelon like a newborn and place it gently in the sink to rinse away the dirt. The bands of green barbed wire are smooth as ice. I see the face the watermelon showed the world, that cheerful summer green blending in with leaves and grass. Beneath its bright belly, it hides the scars of waiting. I turn it over, touch the mottled, yellow skin that carried the weight of sunlight for me. This is the face I love. I trace the days of waiting for the bees, waiting for the sun, waiting for the rain. In stillness, the watermelon yielded to the world and all its wars, growing great with a blood-red secret. The more its heart grew large with wonder, the more the rocks and stones pressed sharply, marking it forever. Now it waits for me to reveal its beauty with my sharp knife. 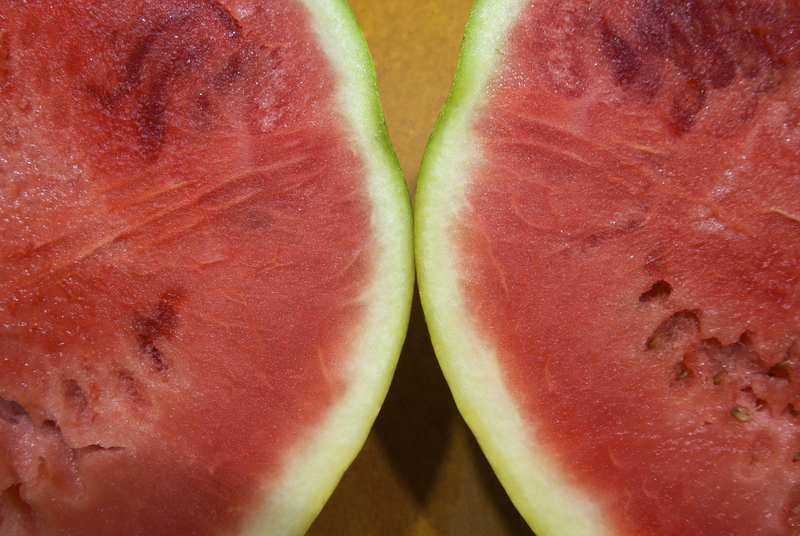 Inside the watermelon’s succulent heart I find seeds, teardrops black as night. The sun never knew its sorrow. Even watermelons want to leave behind some sweetness, some memory of the summer when the red-winged blackbird sat on the fence watching the sun do its work. Very evocative altogether, but you really got me with the red-winged blackbird, one of my favorite birds…. 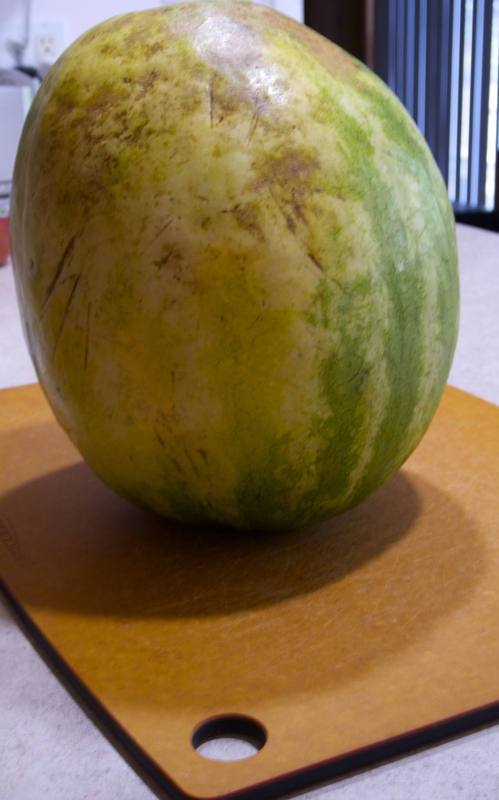 Hmmmmmm…we only get our water melons in summer…a while to wait. Beautifully said! This last one, like most we find, was seedless. I think the seeded ones are sweeter, but maybe I’m just remembering the ones when I was younger. It was rare when we got one that wasn’t sweet. I can eat a whole watermelon in two days by my self! They are so good in the summer. Beautiful color imagery. I love watermelon, but its sweetness is deceptive, robbing me of sleep if I eat too much of it in the evening. It’s so light, you think you can eat a lot of it. A delicious post. But where is all the juice! A lovely piece of writing. There’s always room for watermelon. A woman of many names. I love the notion of the seeds as tears. And then you ate it!! 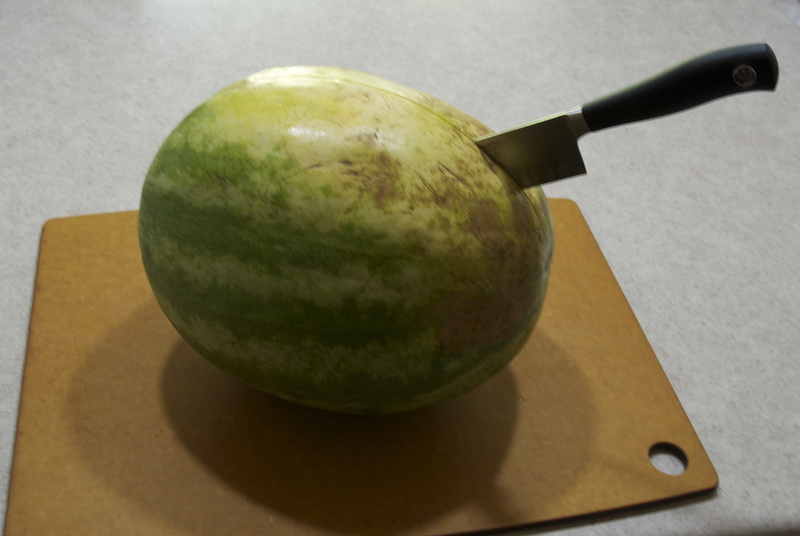 Poor, poor watermelon. Poor and delicious. It gave itself up for me. Lovely and evocative prose. I enjoyed this. Thanks, Susan. I’m glad you did. My own heart grows large with wonder — I’ll never think of watermelon the same way… beautifully written, young lady! Only after its life is over do we realize its beauty. Alas, a familiar story. My husband cuts up the watermelon into bite size chunks, then mixes in chopped fresh mint – nice combination.